When a person is bored with life, negative situations usually follow, and the circumstances we find ourselves in are often perceived as dire; a positive outlook on life is almost impossible. Such is my story. ...I was born and raised in the ghetto, the mean, ugly streets of Brooklyn, New York. And when you live and grow up in the Projects of Brooklyn, writing a book and becoming an author is definitely the last thing on a black street kid’s mind. I knew I needed a positive outlet to vent all the build up frustrations of years being a young black man living in the ghetto... writing allowed me an opportunity to express my feelings...telling my story as...experienced and witnessed as a result of my life in the hood. This book is not the end, but a beginning, a start of my coming to terms with living life on life’s terms and engaging myself in all possible positive and healthy ways that will prove to be beneficial and productive to my future. My aunt, with all the wisdom and the knowledge of the same identical background behind her, was able to provide me with the right kind of advice, suggesting that instead of getting into trouble, I channel my life and put my story into a book...it took another run in with the law and losing my job to consider taking writing seriously. I knew I had to make a complete make-over of what the first 21 years had been. I knew I had to do that if I didn’t want a lifetime spent in the Penitentiary...I remembered many times my grandmother reminding me, “Jail is not an option”. I had the right teachings from my loved ones, but I needed to make my own choices, and I needed to make them soon, or else trouble wanted me, jail wanted me, the streets wanted to claim me, and of course the undertaker wanted my dead body buried in the ground six feet under. So I sat down and began to document life in the hood as I saw it, as I lived it and to tell my story as I experienced it through the eyes of a young African American male. Writing my story was not easy, I had to convince myself I had the ability and the talent to write. Once I got that conviction I could begin my journey from the street to the page. Writing my story has been a long and positive course of action for me. The process of writing was teaching me, it was freeing me of negative demons. I was finally realizing that I was on the right path, doing the right thing. I no longer had to visit the courts or jail anymore, I’m no longer in trouble. 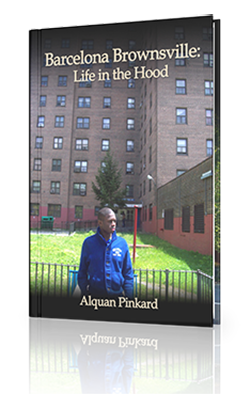 Alquan Pinkard was born in the winter of 1989, on a cold November 4 day in the now closed Saint Mary’s Hospital in Brooklyn, New York. He was raised in a single parent household with his little brother by his mother in the Howard Houses Projects in the Brownsville section of Brooklyn, New York. Alquan received his High School Diploma in 2008. Barcelona Brownsville is his first book. Alquan enjoys sports and music. Alquan Pinkard splits his time between his home in rural Pennsylvania and his home in Maui, Hawai`i, where he enjoys the peace and tranquil blue and green waters. He tours frequently and gives lectures. "If I can do it, so can you. Never judge a book by its cover, do not judge me, unless you have walked in my shoes. Stay positive, stay focused on your goals, and make all efforts necessary to stay on a righteous path and achieve what you want. Believe in the magic of your dreams and go after them. I wish you all much peace and many blessings and above all, hope." If you would like the author to visit your school, bookclub, or prison, please let us know. If you have any questions, please contact the publisher at books@delanepublishing.com.